These are some initial starting points for good design and building practices. Contact us if you have specific questions about your application! 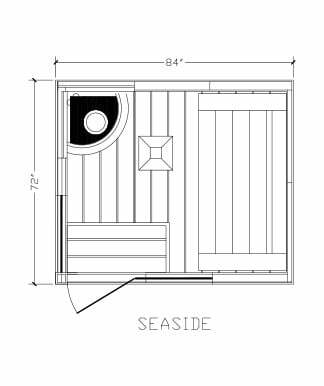 Where should I focus my attention when I start designing a sauna? Of course, the "heart" of the sauna is the heater. 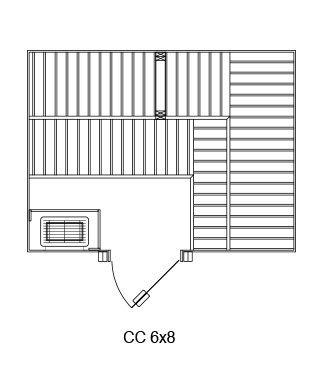 The intelligent selection of a heater model and its corresponding heater control options will significantly impact your overall sauna experience. Sauna temperature ranges and high-quality sauna heater stones are also important variables to consider when beginning to design your sauna. 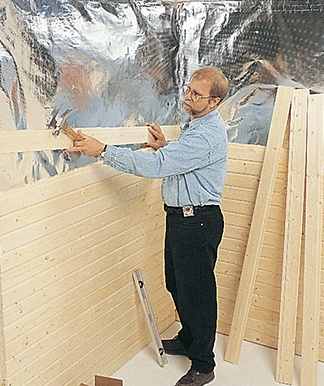 Your sauna should be insulated to a minimum of "R12" on the walls and "R16" on the ceiling. Additionally, your sauna needs an equally effective heater to maximize size according to UL, CSA or ETL guidelines. Locate your local Finnleo dealer for sizing charts. What is the optimal inside height for saunas? The minimum permitted ceiling height of any given sauna is 77 inches. Most often, however, an average sauna ceiling height is 84 inches. Don't forget to check the minimum sauna height in the heater brochure or installation instructions for your particular application. A maximum safe ceiling height, however, is 96 inches. How should benches be arranged? Maximizing bench space and minimizing wasted floor space adds to the efficiency of your sauna and maximizes the number people who can enjoy your sauna simultaneously. Typically. a sauna plan should include space for both a lower bench and an upper bench. An upper bench area can be used as the main calculation in terms of how many users you’d like to accommodate. Factor in about 2’ of bench space per individual sauna bather. What woods are appropriate for the benches and the walls? Usually, the seating boards are built from either Abachi or Cedar woods. Walls are most often covered with Nordic White Spruce, Hemlock, or Cedar wood types. What is an ideal sauna door solution? An all glass door has become the standard, given its stylish and durable characteristics. The glass is resistant to high heat levels as well as wet and dry steam fluctuations. Where should my heater be located? Ideal positions include along the front or side wall (to maximize your main wall and additional side wall bench placement and sizing options). Newer sauna heaters, such as the Tonttu series, allow for unique bench designs - and even designs that allow benches to wrap conveniently around the heater. Your local Finnleo dealer will be more than happy to sketch out potential heater and bench layout options with you and will provide professional two or three dimensional CAD drawings. How should saunas be ventilated properly? It is important to note that colder air mass will always try to move downwards. Room temperature air in the sauna sinks down to the floor level unless it can be circulated properly with the air mass inside the sauna. To achieve the "natural draw effect" and to pull fresh air through the sauna room, it is imperative to position your in-vent directly under the heater so that the heat of the rocks, accompanied with Finnleo’s open air heater design, can properly pull new air into the sauna room. Place the exhaust vent opposite your heater in-vent (as closely as possible) to your maximize air exchange and to optimize the level of the out-vent (which is most often positioned 2 feet above the floor). The goal is to avoid heat loss, while still keeping it high enough to achieve adequate air exchange. If mechanical venting is desired, please contact our technical staff or your local dealer for more information relating to venting your sauna properly. They must be able to withstand high temperatures and significant heat fluctuations. They cannot create dust or discharge any odors. They must sufficiently deliver the heat, grab water and prevent the dripping of water. In other words, an uneven surface is preferable as opposed to an even one. Stones must be large enough so that the air can circulate well between the stones and so that the elements to operate efficiently. Heater stones must hold heat well. Once the room reaches temperature, a rock that holds the heat well will use less energy to stay hot, yet produce wonderful steam. Locate your local Finnleo dealer for sizing charts. We are ready to help with free design service, including 3D CAD renderings. Our knowledgeable staff is available to answer questions and help plan your sauna. ©2019 Finnleo. All Rights Reserved.